The lead line, “Bicycle racing in Honolulu has come to stay,” in the February 8, 1898 issue of the Hawaiian Gazette was more wishful thinking than reality. Charles Desky opened the track in 1897, and it closed the following year; it was located on the makai side of what we now call Kapiʻolani Boulevard, between Cooke Street and Ward Avenue. Desky initially looked to a hui of five to take a long-term lease on the facility and keep it going. However, a newspaper account in May, 1898 noted there would be no more racing at Cyclomere, so far as the hui of town boys was concerned. In 1900, the pond that surrounded the racing bicycle track at Cyclomere in the Kewalo area was filled. Desky dumped the banks of the track into the lake, piled more dirt in and set out to sell lots for residences. Desky saw that as more financially lucrative, particularly since it is became known that the Iron Works was going to that neighborhood. After selling 29 lots, it was learned that Desky did not pay the underlying mortgage down from the sale proceeds, saying he needed the money for other purposes. It eventually was cleared up in court. By 1900, Honolulu had a population of more than 39,000 and was in the midst of a development boom, creating tremendous need for more housing. 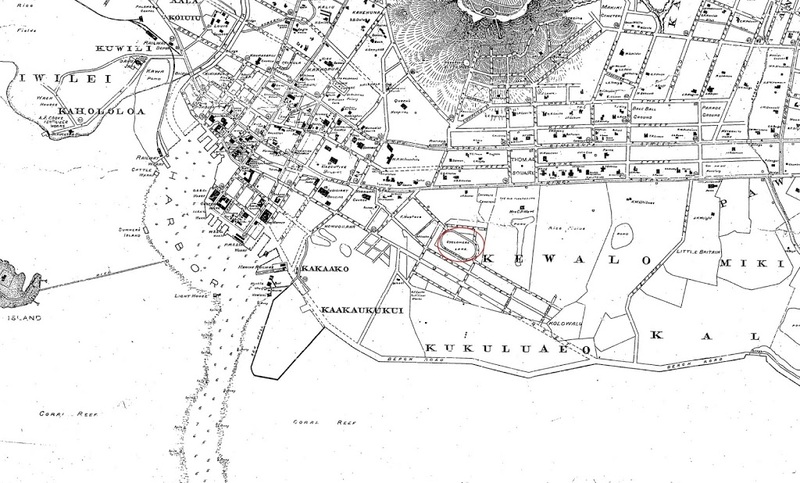 The image is an 1897 map of the Kewalo and surrounding areas, noting the Cyclomere Lake and bicycle track.